Well, I bet he left feeling disappointed! Site meter never tells me where people came from. :( It always says unavailable which is a pity since 20% of my traffic comes directly to an old post so I know someone had to have linked to it (and "links to this post" doesn't tell either). hahaha. oh how i wish i was going to blog camp. good food, good drink, good conversation and blogging!?! what more can a girl ask for? lol. my travelers might have something to do with the fact that i really wish i was going. 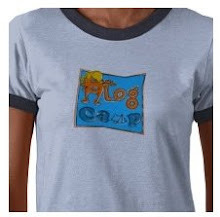 and i blog about blog camp quite frequently. lol.